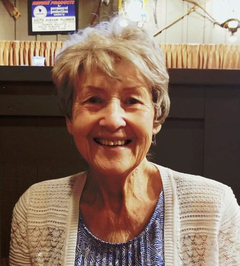 LeElma Arnold (Price), 81, passed away Sunday, October 28, 2018 in Lubbock, Texas after an extended battle with metastic breast cancer. A memorial service for Mrs. Arnold will be held on Saturday, November 3, 2018 at 2:00 pm in the Chapel of Broadway Funeral Directors with Pastor David Eppler officiating. Arrangements were made under the direction of Broadway Funeral Directors. In lieu of flowers, the family wishes donations in Mrs. Arnold’s name be made to the University of Texas MD Anderson Cancer Center in Houston, Texas. LeElma was born March 20, 1937 in Circle Back, Texas, to Lesley and Letha Price. She graduated from Sudan High School in 1955 and later married Ben Arnold on March 3, 1957 in Lubbock, Texas. Mrs. Arnold was foremost a loving mother, although when required, she worked and excelled as a PBX operator. She loved raising, and then spending time with, her extended family. The mother of four boys, she secretly wanted to raise a girl. She attempted to “adopt” every girl her sons brought home, many of whom remained her friend long after the relationship with her sons ended. Later in life she finally had the opportunity to raise one of her granddaughters, Misty. Ten grandchildren; Seven great grandchildren, and one great, great grandchild. She is preceded in death by her husband, Ben and a brother, Lesley Price Jr.